The global photopheresis products market features a highly consolidated vendor landscape with top three companies holding more than 95% of the market in 2015, says Transparency Market Research in a new report. These companies, namely Mallinckrodt, Med Tec Solutions, and Macopharma are engaged in the development of new kits/devices that overcome the loopholes of existing products in order to stay competitive in this market. Development of smaller, lighter devices is also the focus of the top companies in the photopheresis market. “Educating and training healthcare practitioners and the masses about extracorporeal photopheresis (ECP) therapy and its benefits is also the focus of top companies in this market,” says TMR analyst. An excellent example is Mallinckrodt’s Therakos Institute. The company is engaged in imparting clinical education and training to patients, technicians, and nurses regarding photopheresis operating modules and their benefits. According to the report, the global photopheresis products market is expected to exhibit a CAGR of 5.9% between 2016 and 2024. Rising at this pace, the valuation of the market which was US$223.1 mn in 2015 is expected to reach US$371.1 mn by 2024. On the basis of product type, closed system photopheresis products held more than 80% of the overall market in 2015 and the product segment is expected to lead over the forecast period as well. Closed system photopheresis products are widely used by healthcare practitioners as they have advantages of reduced treatment time, less risk of infection and contamination, and easy treatment procedure compared to open systems. Closed system photopheresis products are the only devices that have received FDA approval for the treatment of CTL conditions. Closed system photopheresis devices account for 70-80% of overall photopheresis devices in use. North America current leads the global photopheresis and is expected to retain its lead position over the forecast period as well. The market held more than fifty percent of the market in 2015. Favorable reimbursements by governments in the region for various disease indications such as CTL, GVHD, and lung transplantations treated by ECP therapy is a major factor contributing to the lead position of North America. Moreover, extension of reimbursement coverage by Medicare for treating bronchiolitis obliterans syndrome (BOS) using ECP therapy holds promise for the North America market for photopheresis products. However, dearth of treatment centers that provide ECP therapy is expected to hamper the photopheresis market in North America to some extent. Nevertheless, positive factors that will present favorable growth opportunities will lead the North America photopheresis market to display a remarkable CAGR of 5.8% from 2016 to 2024. 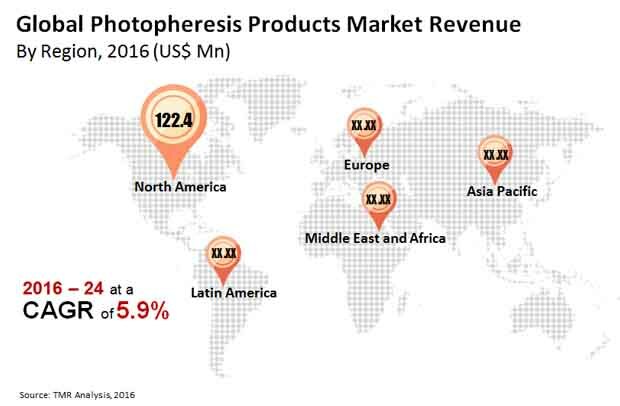 However, Asia Pacific will surpass North America in terms of growth rate in the photopheresis products market over the forecast period. The market is expected to display a CAGR of 6.6% between 2016 and 2024. The increasing number of photopheresis centers in the region is the key driving factor of growth of this region. Speedy regulatory approvals, initiatives from corporate organizations for research pursuits in ECP, and increased adoption of advanced photopheresis devices are favoring the growth of Asia Pacific photopheresis products market. Photopheresis has emerged as one of the most effective treatment options for autoimmune disorders, which is the primary factor driving the photopheresis products market. The safety and efficacy of ECP therapy is leading to its increased preference among healthcare practitioners over drug treatments. Government agencies are also encouraging patients to treat a number of disease indications using ECP therapy and have laid out favorable reimbursements policies as well. However, factors such as high cost of ECP therapy and longer time of treatment over other popular treatment options is challenging the market’s growth to some extent.